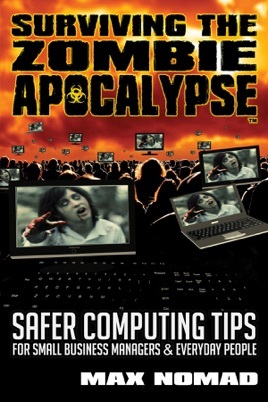 SURVIVING THE ZOMBIE APOCALYPSE: SAFER COMPUTING TIPS FOR SMALL BUSINESS MANAGERS AND EVERYDAY PEOPLE is a cyber survival guide for anyone whose business and personal life is connected to the Internet. This friendly, novice-oriented reference uses the frightening -- and often campy -- Zombie Apocalypse as an allegory for the dangers of cyberspace. Written for PC and Mac users, SURVIVING THE ZOMBIE APOCALYPSE is an armchair safari into the world of cybercrime. Readers will learn how to protect themselves through cautionary tales and insider explanations that take the mystery out of how these things work: how computer viruses and malware are part of a multi-billion dollar industry, how stolen credit cards pop up thousands of miles away without leaving their wallets, and how easily our computers can be used to commit crimes without our knowledge. Business managers will enjoy real-world strategies for preventing data theft and other digital disasters, along with cybercriminal secrets such as how even the best network security can be defeated with a phone call. In an era where hackers regularly prove that even Fortune 500 companies are not safe from crippling cyber attacks, this book is a must for any home or small office.